Celebrate Your Graduation with a Party Bus from Aall in Limo! Graduation is a special time in your life — whether you are graduating from high school or from college, you should feel very proud of yourself. Graduation marks a huge step in your life and is something that should be celebrated. Graduation is a unique moment, a step forward in your life that you should cherish and celebrate with all your friends. Even if you are graduating from high school or from college, you worked hard to get your diploma and you deserve to have a party, one that you will remember. After all the late nights of studying for the upcoming exams, the time for party has finally arrived! Let Aall In Limo & Party Bus take care of the rest. Our aim is to satisfy each and every single client that picks us for their special event. From local clubs to big concert halls, San Diego has the perfect locations for you to party all night long. Immortalize the moments and make memories with your friends that you will never forget, our Party Bus will definitely help you secure them for the next years. No matter how you decide to celebrate this milestone in your life, a limo bus can help you do it safely and in style and will be something you will never forget. For you San Diegans that have graduated and are ready to embark now on a new chapter in your lives, we offer you our luxurious Party Bus. What better way to celebrate this milestone in your life than spending a night out with your friends! Your options are endless. The Party Bus has leather seating, a bar, quality lighting system and surround sound, and so much more! It is equipped with all the necessary amenities and the laser light show will definitely make you feel like a VIP. We also offer assistance in helping our customers find venues where they can celebrate this milestone. Our drivers are skilled, experienced and professional, so seeking the perfect place for such an important event will not be a problem for them. Our Ford F550 super diesel has a Krystal Koach KK28 body, Alpine AM/FM CD/DVD player with iPod, MP3 player, iPad, smartphone, tablet connection, automatic climate control, white exterior with black interior, full length leather U-seat, privacy blinds and 5% tinted window, fiber optic lighting with sparkle lights, laser light show, starlight ceiling/mirrors, and can hold up to 20 passengers. Our Mercedes Sprinter is a diesel with a Krystal Koach body, perfect for medium sized groups of up to 13 people. It has a plasma TV, premier sound system, white exterior, tinted windows and chauffeur intercom. 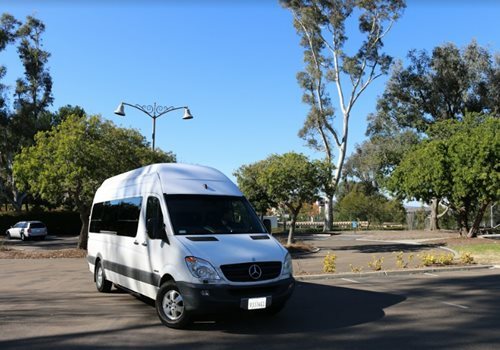 Book our Mercedes Sprinter and go out for a night of clubbing Downtown or book a San Diego beer tour with your family and friends. Your whole family can have a great time celebrating your graduation day, a monumental event for any family. Our Party Bus can welcome up to 14 passengers and is great for medium groups, but can also be perfect for small groups that desire more space. Within a short time, an event that you thought was not going to happen is ready for you to enjoy! Our staff is devoting themselves to any party, taking care of arranging decorations, food, music, beverages and more. Overall, no matter how you decide to celebrate this wonderful event in your life, a party bus will definitely help you do it safely. We look forward to helping you celebrate this huge life achievement! Whatever you dream of, we can make it come true! In order to book a Party Bus in San Diego for your graduation, contact Aall In Limo & Party Bus today. Our drivers will be extremely happy to be part of your special day and make it even more memorable. We will treat you like a VIP, roll out the red carpet, and complimentary champagne will be served for those over the age of 21. Call us at 858.336.1894 for more information and booking!